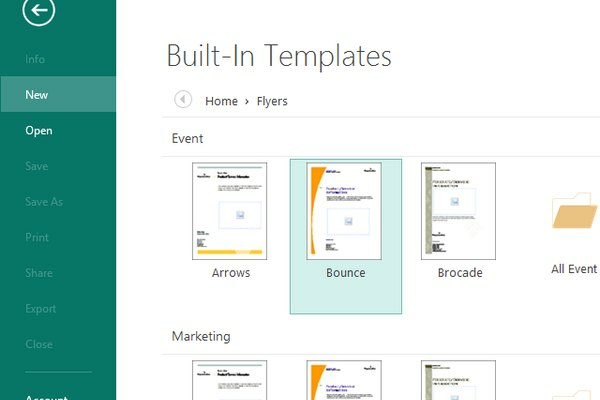 Create a leaflet in Microsoft Publisher using the built-in Flyers templates, which you can select when you create a new document with Publisher. Double-click Flyers from the list of template categories presented. Publisher displays a list of flyer templates in different styles. Choose a style and double-click it. The Flyers category contains templates for single-page documents. 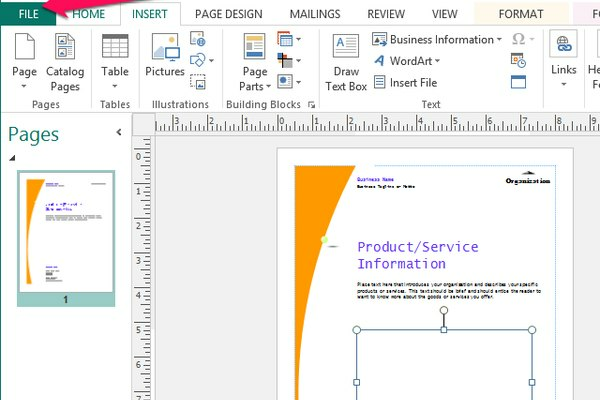 To create another type of document, such as a multipage or trifold brochure, browse the template categories to find the document type closest to what you want, using the small images overlaid on each template category as a general guide to what documents in the category look like. 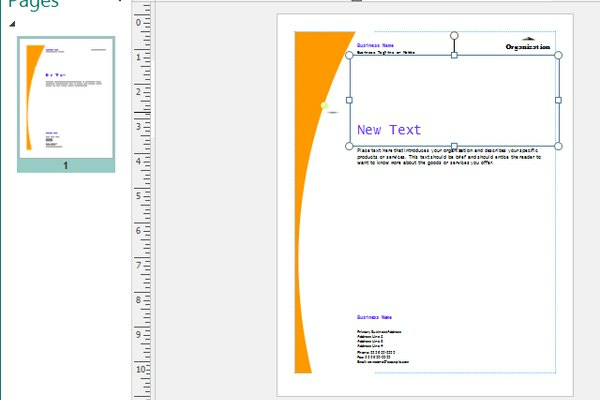 The Publisher document opens with elements such as text boxes, shapes and images already positioned on the page. You can change any of these elements, remove them or add new elements to the document. To move an element, click on the element, hold down the mouse button, and drag the element to a new position. To resize an element, click on the element to select it and display the resize handles, which are the squares on the sides and the circles in the corners. Click on one of the resize handles, hold down the mouse button, and drag to change the size. When you drag a corner, the element changes size without changing dimensions, but if you drag a side you stretch the element wider or narrower than it was. To delete an element, click on the element and press the Del key. 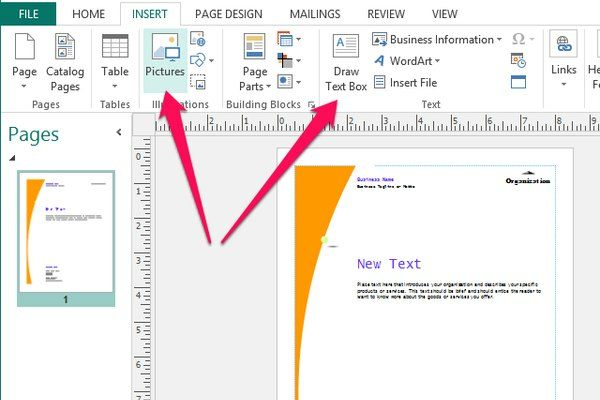 To insert a new text box, select the Insert tab on the ribbon and click Draw Text Box. To insert a new image, select the Insert tab on the ribbon and click Pictures. 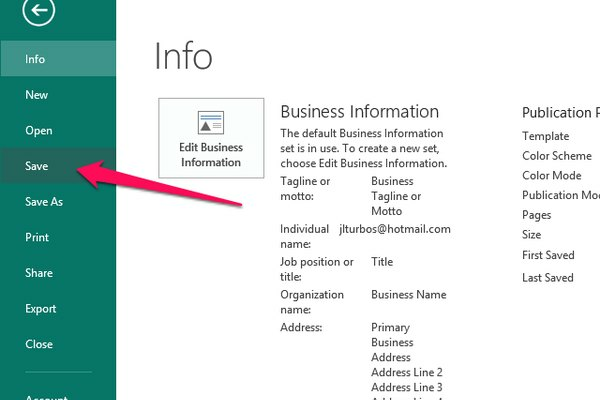 To edit the text in a text box, click in the text box and then type to add, delete or modify text as you would in any document. To change the format of text in a text box, highlight the text you want to change, click the Format tab in the Text Box Tools section of the ribbon, and select an option to modify the format of the selected text. 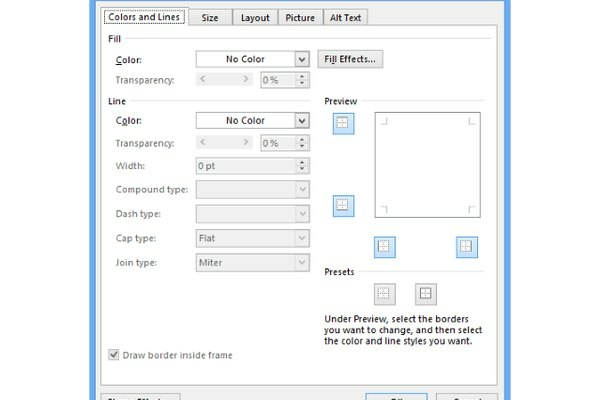 To change how an image is displayed, click on the image, click the Format tab in the ribbon, and select an option from the ribbon. To see detailed formatting options, right-click on the object, select Format Picture, Format Autoshape or Format Text Box from the menu, and edit the options in the Format Object dialog. After you finish making changes, select the File tab on the ribbon and click Save. 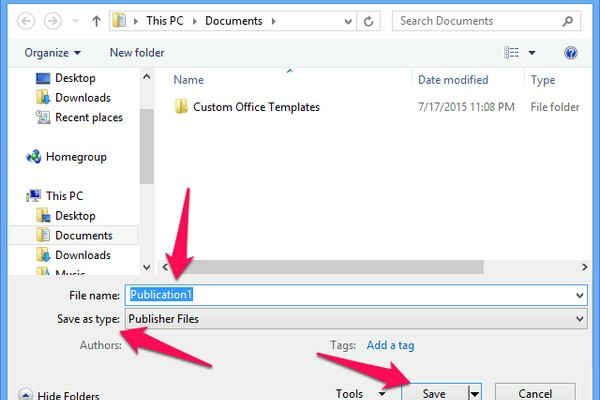 Publisher prompts you to enter a new file name for the document. Make sure to browse to the location where you want to save the file before you press the Save button, so you know where to find the new document. 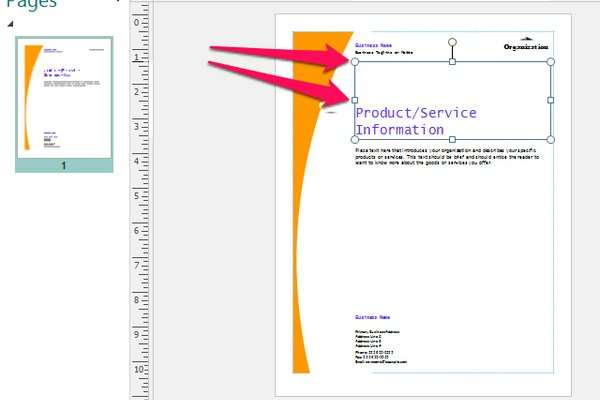 If you make changes to the location, size and format of elements in the document, save your changes as a new template so you can easily create new documents that look the same. To save your changes as a template, select the File tab on the ribbon and click Save As on the side bar. Type the name of the template in the File Name field, change the Save asType field to Publisher Template (*.pub) and press the Save button.